Yes we are serious when we say 95% of all losses are left wet enough to support microbial growth. While it’s rampant with preferred vendor systems who are limited to 3 to 5 days of drying, it also happens more often than you think with some restorers. It’s actually easy to do. 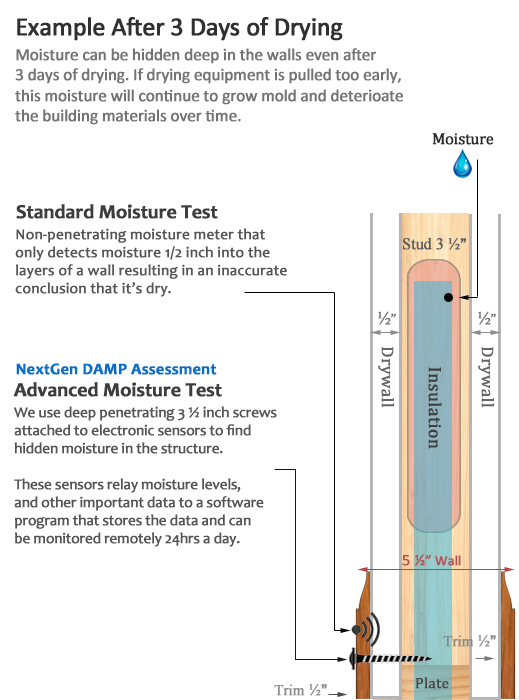 All you have to do to make a structure that is still wet look dry, is to use a non-penetrating moisture meter that only measures the first ½ inch of a 5½ inch standard interior framed wall. Walls dry from the outside in, so the trim will get dry first, followed by the drywall, followed much later by the wood framing. Within 3 to 5 days, the trim will be at dry standard. But since the non-penetrating meter only reads a half inch, when you use the meter it only reads the trim and excludes everything behind it. This is the reason we use 3½ inch screws to test for moisture. These deep penetrating screws, when used with our DAMP (Deep Assembly Moisture Profiling) – reveals moisture hidden inside the wall structures that will, within 24 to 48 hours, begin to support microbial and bacterial amplification. We know it’s hard to believe that companies that are designed to first and foremost dry a structure and prevent mold, actually, almost every single time, create the environment to support it hidden behind the wall assemblies. We feel consumers need to understand this. We are doing our very best to educate both the industry and the consumer about these practices and create transparency so you, the consumer, can get the work product you think you’re currently getting but are not! What's the 3 Day Drying Myth? In the early 1990’s to 2000’s restoration drying science was in its infancy and it was thought that all materials in a structure could be dried in 3 days. Two decades later with advancements in testing equipment and technology, it was discovered that earlier theories were incorrect and actually dangerous. Structures not dried properly can result in deterioration of building materials, and growth of toxic mold, which is extremely hazardous to human health. In the professional water damage restoration industry, the old and outdated theory is now referred to as “The 3 Day Drying Myth”. Water damage restoration techniques are a far cry from the early days when carpet cleaners were responsible for extracting water after a flood. When the toxicity of mold was discovered, the restoration industry worldwide went through many changes. New standards were developed, training and certification was required, and new government regulations were introduced. Innovations in technology have led to better equipment, testing and science is now making it possible to determine if a structure is dry. Your insurance carrier may suggest hiring a contractor from their “preferred vendor list”. Be cautious, insurance companies will often limit their preferred vendors to 3 – 5 days of drying to reduce claims costs. Pulling drying equipment too early is the number one reason structures are being left wet. Discovering a mold problem months after a claim is closed can result in expensive litigation. 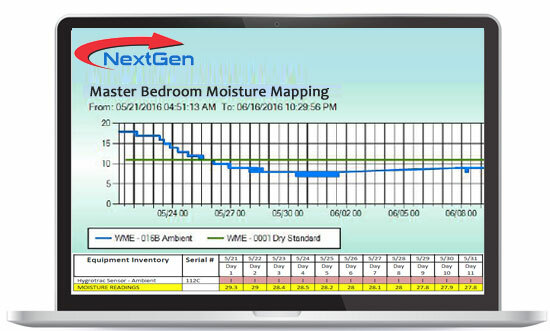 One of the reasons NextGen has been so successful at drying structures is greatly due DAMP assessment – diep assembly moisture profilingAt NextGen, we use the latest technology and equipment to make sure structures are dry and safely restored. Our advanced testing and monitoring are an important part of our restoration and remediation procedures. With our advanced moisture tracking and analysis software we can remotely monitor the overall structure which is an extremely key factor when restoring to a dry standard.